The herbs in our little container garden are abundant at the moment. Even the basil has responded to the recent warm weather. This just goes to show that you can have a productive and tasty herb garden no matter how limited the space available. I think herbs are the best thing to grow in pots as they add a lot of flavour to dishes when freshly cut and are happy to be in containers. Vegetables usually require more space and don’t always do well in pots though there are some new varieties on the market. 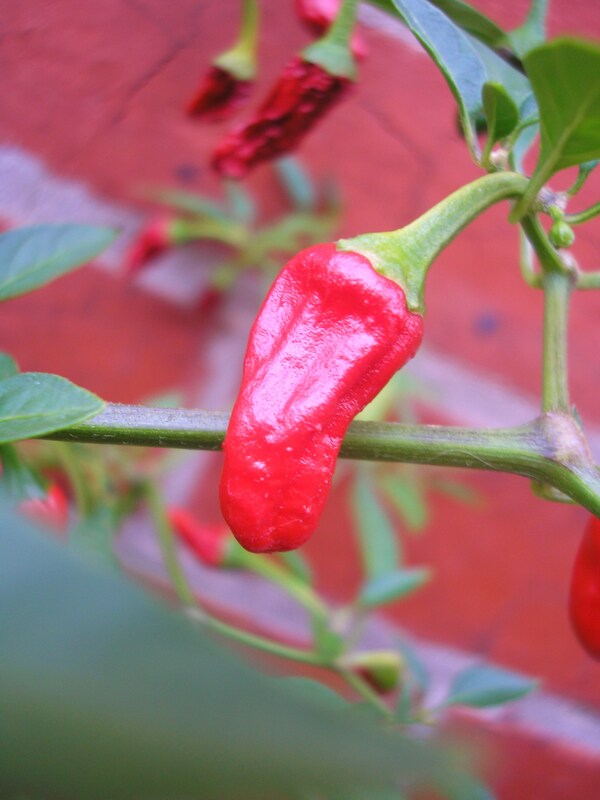 I have some tiny chillies in a pot that are doing well – a little too well in fact as there are only so many surprisingly hot little red chillies I can use. I made some chilli oil to use in my Chinese cooking and I might have to hunt around for a Sambal Oelek recipe. These little babies are hot! The sage plant my mother gave me appeared to have shuffled off this mortal coil but it has since resurrected itself and looks vigorous and healthy again. 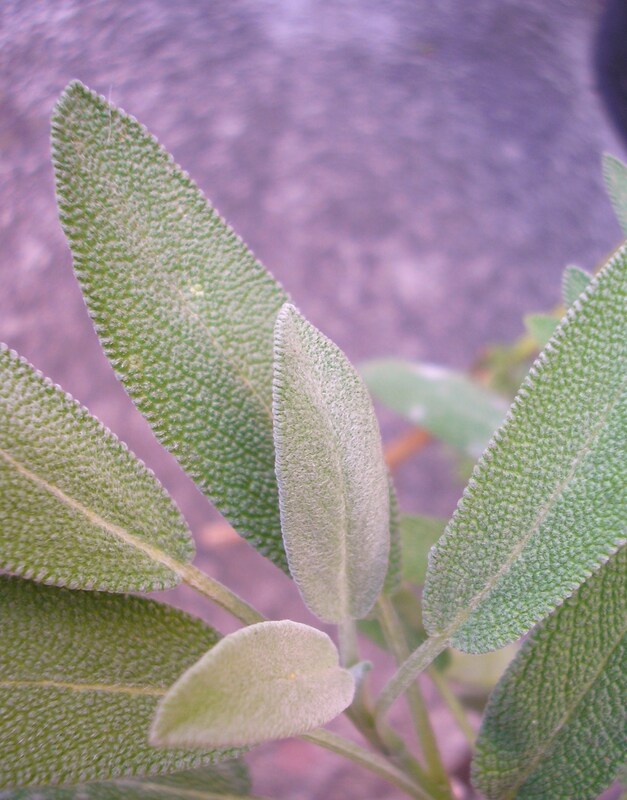 I have been using it in stuffings and terrines and to make the Italian classic Saltimbocca – a piece of veal or chicken beaten out thinly, topped with a sage leaf and prosciutto and fried, prosciutto side down, in a hot pan with butter. 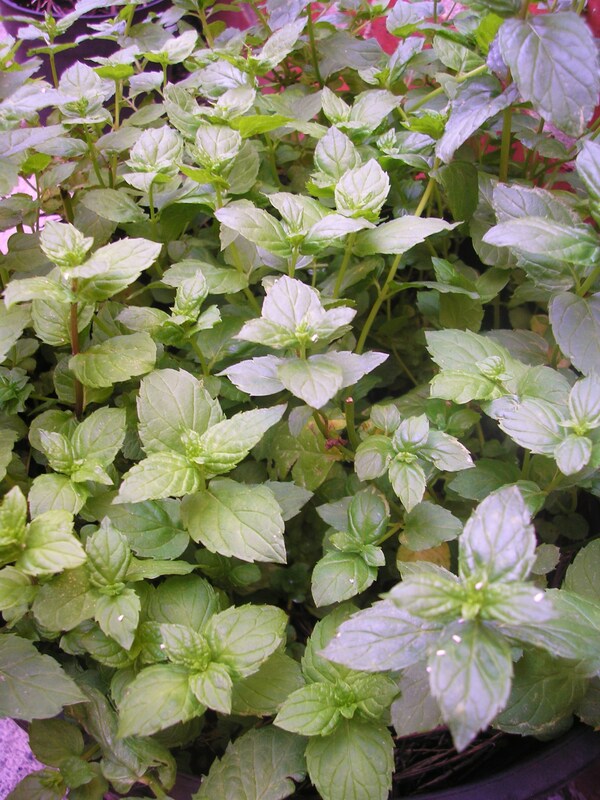 The mint has also been growing abundantly and I have been using it to flavour cous cous and tzatziki and to make tabbouleh. A different way to use mint is to add it finely chopped to cubed watermelon, finely sliced Spanish onion and crumbled feta then dress with lemon juice and olive oil. Many people buy ready made satay sauce in a jar or a bottle – this is all right but it is really not that hard to make your own and it tastes so much better. All it takes is the acquisition of a few key ingredients. Kecap manis, fish sauce, palm sugar, tamarind concentrate – these are the sort of things you would want around anyway if you are cooking Asian food regularly. The two countries that really love their satay are Malaysia and Indonesia but variations or similar dishes are found throughout South East Asia, China and India. 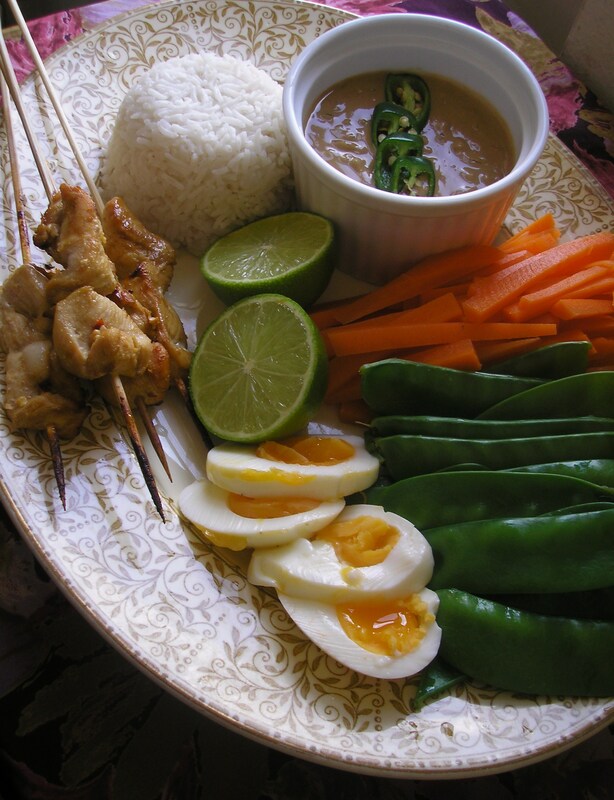 The satay sauce that I make can be made in larger quantities and frozen, this makes it a super quick and easy meal – all you need to do is cook some rice, grill some meat and heat up the sauce – a quick salad on the side and you have a good meal. Thread one or two strips of chicken on to each skewer. Mix all remaining ingredients in a bowl and pour over skewers, turn to make sure they are well coated in the marinade. Cover with cling film and refrigerate for 1 hour. Meanwhile, heat the oil in a heavy based saucepan, when hot add the onions, reduce heat slightly and fry for a couple of minutes. Add the finely chopped birds eye chillies and fry for a further minute. Reduce the heat and add the coriander powder, tamarind and peanut butter. Cook, stirring, for a few minutes. Add the palm sugar and kecap manis and stir for a further minute. Add the coconut milk and the water, bring to the boil and reduce over a low heat for 30 mins, stirring occasionally. Finish with the fish sauce, lime juice and fresh coriander. Set aside. Grill the chicken skewers until browned and serve with the satay sauce, steamed rice, eggs and blanched vegetables if desired. When Europeans discovered the so called ‘new world’ they also discovered chocolate. How the natives felt about these strangers from what they considered an alien new world is anyone’s guess but it seems the secrets of extracting chocolate from cacao beans were generously given to the intruders. In ancient Mayan culture chocolate was consumed in liquid form from a paste made by fermenting, drying, roasting and winnowing the cacao beans to produce what are known as chocolate ‘nibs’. These were then ground on a stone and mixed with water and other flavorings to make a drink. The same process is still used today to make the chocolate nibs needed for chocolate production. For a couple of centuries chocolate was consumed all over Europe but only in liquid form. Somewhere along the line sugar was added and the mixture was heated – the Mayans had consumed their chocolate cold and unheated. It wasn’t until the nineteenth century that the processes needed to make solid chocolate were discovered. The process used to manufacture cocoa powder from the nibs was discovered by a Dutchman named Van Houten in 1828, this was the first step to making solid chocolate. Further refinements in the chocolate making process were made by the Fry and Cadbury factories in England in the middle of the century. Finally, the discovery of a process to make powdered milk by evaporation was discovered by Swiss chemist Henri Nestle´ who collaborated with a Swiss chocolate manufacturer to produce the first milk chocolate bar. These new processes were quickly adopted by the Hershey factory in Pennsylvania and chocolate production on a mass scale began. 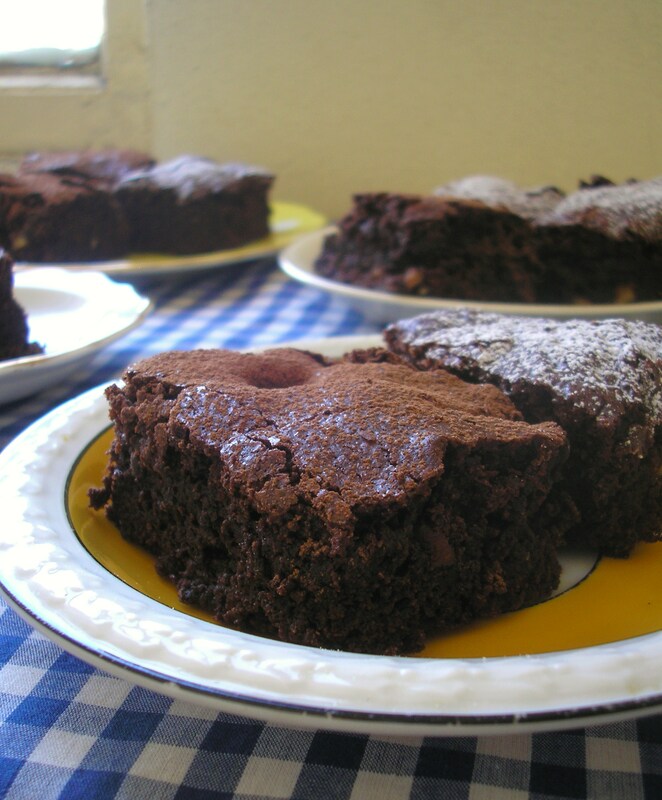 One good way to use chocolate is to make the American classic chocolate brownies. These have become quite popular here in Australia in the last couple of decades and are surprisingly simple to make. Here’s my recipe. Grease and line a 25cm x 25cm cake tin with baking paper. In a bowl over a saucepan of gently simmering water melt the butter and the chocolate. When melted mix well and add the chopped walnuts. In another bowl, sift the cocoa, flour and baking powder. Mix through the caster sugar. Add the melted chocolate mixture to the dry ingredients and mix well. Add the eggs and combine well until the mixture is smooth and glossy. Pour into prepared tin and bake in a pre-heated 180c oven for 25-35 mins or until the top is springy to the touch but not too crisp and the middle is not too gooey. Serve warm with cream or ice cream or cold dusted with cocoa or icing sugar. To make Triple Chocolate Brownies add some white or dark chocolate bits to the mixture at the end. The brownies can also be iced if you wish. Like other South East Asian cuisines Thai food incorporates a balance of flavours. These are derived from lots of fresh ingredients, a variety of pastes and dipping sauces and the ever present rice and rice noodles. Fish sauce (nam pla) and shrimp paste are used in many dishes, as are lemongrass, lime juice, palm sugar and chillies. Other common ingredients are coconut milk, tamarind, coriander, Thai basil and kaffir lime leaves. 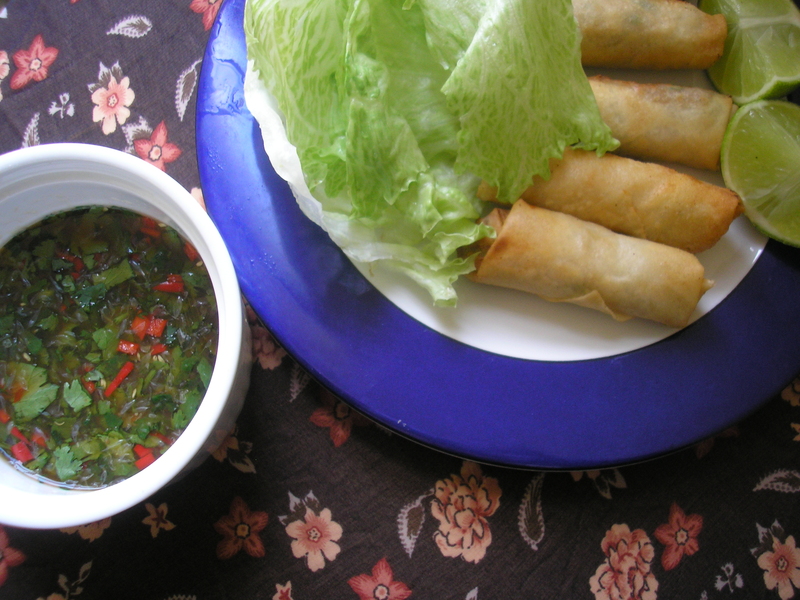 These little Thai spring rolls use a variety of Thai ingredients and are surprisingly simple to make. They are good served with a hot, salty, sweet and sour dipping sauce. In a large bowl, mix together all ingredients apart from the spring roll wrappers and the ingredients for the dipping sauce. I find clean hands are the best for this, you can use gloves if you wish. Cover and place in the refrigerator for an hour. Thaw spring roll wrappers and separate the sheets. You will need a clean board and a cup of water. Place the spring roll wrapper in a diamond position on the board. Place a small amount of the meat filling, moulded into a cylinder shape, near the bottom end of the wrapper making sure to leave a small triangle of pastry. Fold the small triangle over the meat and tuck in the edges like an envelope. Wet the rest of the pastry with some water and roll up. Try to make sure they are well sealed. Place on a plate, seam side down and continue until all the filling has been used up. Heat enough sunflower or peanut oil in a wok for deep frying. You know it is hot enough when bubbles form around the handle of a wooden spoon dipped in the oil. 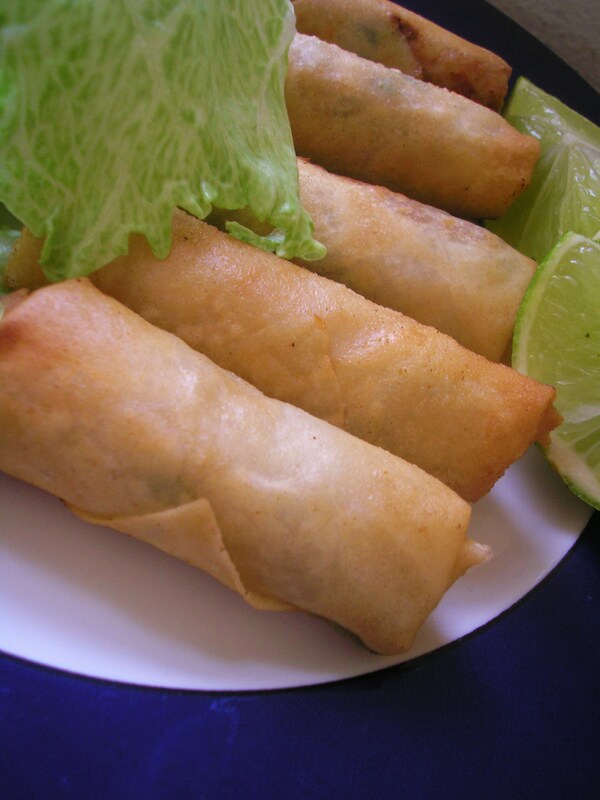 Fry the spring rolls in batches until lightly golden. Drain on a wire rack and serve immediately with the dipping sauce. Mix together all ingredients, if it is too strong add a little water. If you are having trouble getting the balance right a tablespoon of sweet chilli sauce is optional.